There are 100,000 child soldiers in Africa. According to Amnesty International, in the Central African Republic alone, they number 30,000. For the past ten years, child soldiers have become indispensable and are a trademark of rebel groups. 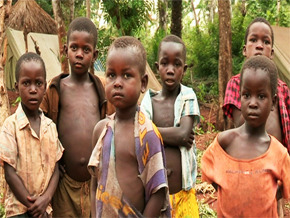 The film follows in the footsteps of the Lord’s Resistance Army, the LRA, a rebel group which was initially formed to resist the Uganda People’s Defence Force but now has been accused of widespread human rights violations, including forcing children to participate in acts of violence as soldiers of the LRA . The army which initially operated in northern Uganda and South Sudan has since spread to the Democratic Republic of Congo. Joseph Kony, the chief of the LRA, was indicted by the International Criminal Court in 2005 on 12 accounts of crime against humanity and 21 counts of war crimes and is still at large. From Paris to La Haye, and all the way to the Central African Republic, the film leads us along the path of the Lord’s children to hear their heart-wrenching stories.